The download link for Warza, Warhammer Online WP Theme IS NOW AVAILABLE! It is released for FREE but please respect the credits attributed to me and EA Mythic/Games Workshop for the Warhammer IP. Wanna see how my Warhammer WordPress Theme looks like? Warza 1.0 Download link and Demo Preview after the jump. Comments? Suggestions? Please let me know so i can improve on this Free Warhammer Theme. Shin Megami Tensei MMORPG in English!!! in the next 24-48 hours =) still ironing out some kinks . thanks! Nice looking theme! Thanks for doing this. Thank you for this wordpress theme, really helpful for making my guild’s page. NP. More power to your WAR guild! 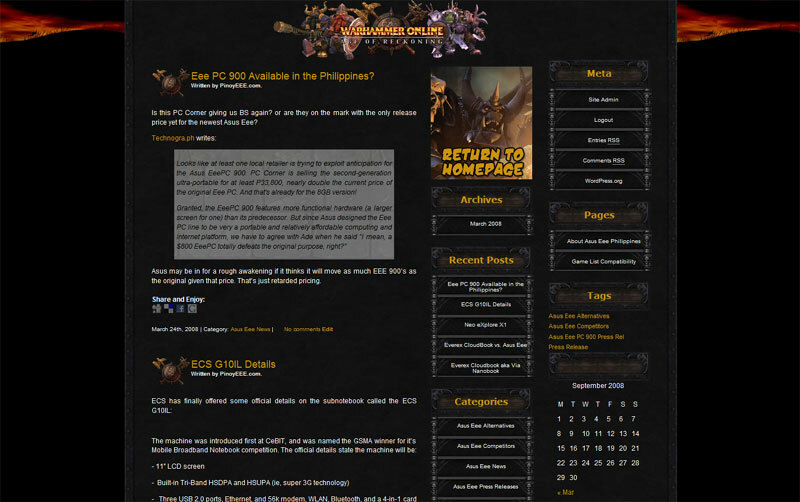 Pingback: Punkdudez » Looking for the best and free Warhammer Online Themes? Great theme. Thanks for this warhammer online worldpress theme i will try it. Learning when and how to use it will help a lot in helping you conquer all the enemy and level up fast.